Why "Back to the future"? One afternoon towards the end of the last century — it sounds so far away already, but it wasn’t all that long ago — Kurt Masur and I were discussing the enormous breadth of musical expression the 20th century had offered. We both wanted to start the new century in a meaningful way. Eventually we arrived at the idea of looking back to the future, since the repertory we’ve lived through in the last century will be the historic repertory of the next. I was not always so closely involved in the music of the 20th century. The seed of my involvement in this music was planted about fifteen years ago through the passion of one man: the Swiss arts patron, conductor, and mentor Paul Sacher whose generosity brought so many landmark 20th-century works to fruition . It was Sacher who introduced me to the excitement of collaborating with contemporary composers like Witold Lutoslawski, Wolfgang Rihm, and Krzysztof Penderecki. I soon found that working with these creative musicians, bringing their compositions to life on the concert platform, was thrilling. At the same time, I began to explore in greater depth the music of the earlier decades of the 20th century. The violin came into prominence in the 18th century; during the 19th century, the piano took over — it was the new thing, the "computer" of its period, it dominated the market, and composers were rightfully fascinated by the new medium. But the violin once again achieved glory in the 20th century. As I explored this literature I found that composers had developed the repertory for the violin in new directions, but that many of these developments had grown organically out of musical forms, like the canon or the passacaglia, that had existed for centuries. In the beginning it was strange territory, sometimes frightening, often challenging, but always immensely exhilarating. The choice of composers and works represented in "Back to the Future" is entirely mine. And it is a very subjective choice. Each piece is distinctive, and I found extraordinary contrasts between them: for example, only seven years separate Webern’s Four Pieces for Violin and Piano, Op. 7 of 1910 and the Respighi’s Sonata for Violin and Piano of 1917, yet they could scarcely be more contradictory. In the Webern you have this sparse explosive array of sounds while Respighi sets you dreaming of Brahms and Italy. This immense variety recurs throughout the repertory. Is there a common thread? Yes: I have chosen pieces that exhibit color and expressivity; none of these pieces was composed as an experiment or as a purely intellectual statement. All of this chosen music is deeply rooted in the past without trying to copy the past. All of it expresses the coloristic quality, the emotional quality of the instrument, the sculpting quality of the sound production that the voice and the violin have in common. It’s hard to find a period that’s been as musically diverse as the last hundred years. That’s what has made this project so compelling. Traveling through the century with wonderful colleagues like Maestro Masur and the pianist Lambert Orkis has been, and continues to be, an enthralling adventure. 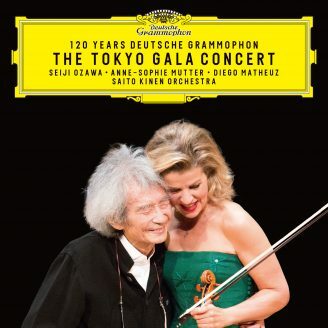 Anne-Sophie Mutter dedicated her project "Back to the Future" to Paul Sacher.